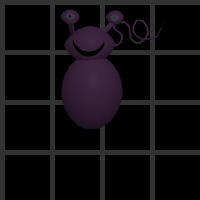 Zorp the purple alien is going to be starting his own website soon. It will be a super-hot index of links to Babes, Games, Cheat Codes,Pokemon, Jokes, Desktop Themes, Urban Legends and more. And since everyone is invited to help, it's expecting to grow quickly. Unfortinately, Zorp's Best Friend, Vozo.com the Cleverfrog , wanted to add in all sorts of nasty stuff, like Mp3's, Arcade Game Emulations and SNES ROMs. Zorp didn't like this! Although Vozo knows that you shouldn't download anything that you don't have a right to use, he decided that people can be trusted to stay away from copyrighted songs and games that they didn't already have the right use. So he linked to these things anyways so you could play your favorite songs and games on your PC, instead of having to use your old record player, standup console or home video games. Vozo's site is already working. Zorp is still working on his. Thanks for stopping by! Please visit Zorp at Vozo.com .